"On Boulder Highway" poetry about East Clark County Nevada. In time, I found my way back to the desert. A cool Louisville lady was on my arm. Rockin' sharkskin pants, and a bitchin' shirt. Checkered flag ring was my good luck charm. Read the mini bar menu, and clutched my heart. I chose the eight dollar water which was 'smart'. Headed down to the casino floor around 2. What's the deal with your WWBD tattoo? He was older, but not quite retired. The standard sizing up wasn’t required. But I didn’t wear my values ‘on my sleeve’. So he didn’t have it quite so simple. A gauge on my preferences or my temple. The private Villas at The Mirage. “Love” by The Beatle’s. Parties at Tao. All a part of my Las Vegas collage. Then I opened up about the stuff I'd bought. Dropped ninety grand for geodes and a predator. I scored a Wyland, though not the one which I sought. Then came the bad news from my editor. Seems my fans’ devotion has fallen off lately. My realtor had found a nice home in Bel Air. Guess I’ll be writing in a place not so stately. But those words came out like a confession. As if reading my obit or epitaph. The stranger smiled. It was his turn to laugh. For a vista which will inspire. If you don’t like to think, or perspire. So, clear off your planner. Drop the straight life fixation. Take Desert Inn straight to 582. You’ll enjoy a new world view. Said my new friend, from his bar stool. “Plan your work, and work your plan. Lead to coronaries and grief. They’re all heading for disaster. Take Flamingo straight to 582. Introduced myself as a Texas messenger. For some local knowledge, I was fishin’. Then explained to my fellow bus passengers. An East Las Vegas ode was my mission. One guy said Sam’s Town was his favorite place to play. “Don’t expect a Steve Wynn vibe,” was his caveat. Another gave kudos to the Station’s buffet. Which he’d take over anything the strip has got. If you do, make sure you’re out by sundown. One thing for sure, the gent had my attention. An apartment complex which needs a warden?!? I asked the name of the stalag he'd mentioned. “Royal Manor” suggests a residence of Nobles. No doubt the aim, since it looks like a castle. At 3pm, they said I shouldn’t get hassled. “Next stop: Boulder Highway”, was announced overhead. It was 5 to 1, that by 4, I’d be dead. Take Sahara straight to 582. Had the leasing agent withheld details? I wondered, as my neighbors left in hand cuffs. What’d I expect, this ain’t the Palace at Versailles. And I thought Compton and 8-Mile were tough. I quickly got weaned off of Dom Perignon. Yeah, the problem was simply one of scale. At four dollars a bottle, when it's on sale. But the gal to guy ration had me balking. Locked eyes with an amazon, with legs up to there. 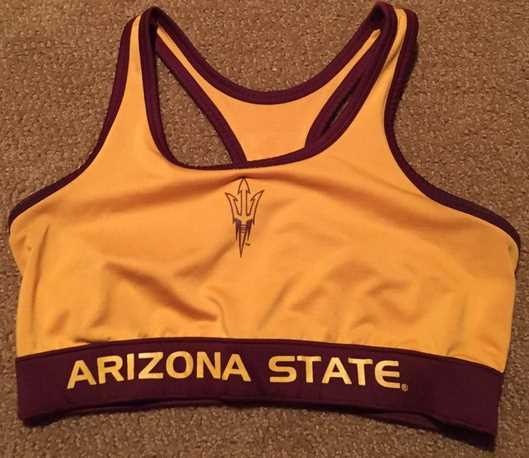 Her ASU sports bra did the talking. I assumed that she cleaned up pretty well. And it was a plus that she smoked my brand. Til you've figured out the lay of the land. I’d neither seek nor accept the Presidency. My arms were hugging the porcelain pooper. Just a month into my Sportsman’s residency. “Take me now, sweet Mother Mary”, I would plead. After chewing ice, they began to recede. I heard "Go All The Way". It came from the toilet. Glanced down to see Bukowski looking up at me. His message clear: Stopping now would only spoil it. Then from deep within, I heard: "Go all the way." Wait, not within. Hell, it came from the toilet. For a skid row existence, wasting their primes. Take Tropicana straight to 582. Just let their passions smolder. On a street known as Boulder. PS - I sometimes include what I call "poetic remnants" following a work. These are passages which didn't make the cut, for whatever reason. During the period known as Miller Time. After three or four Dos Equis and lime. Alright. Thanks for your time and consideration. Keywords: Skid row poetry, Poems inspired by Dale Carnegie and Henry Charles Bukowski, Jr., Poems inspired by The Mirage and The Venetian Resort Casinos in Las Vegas, NV.